The beautiful and bright bee-eater flashes through the air. 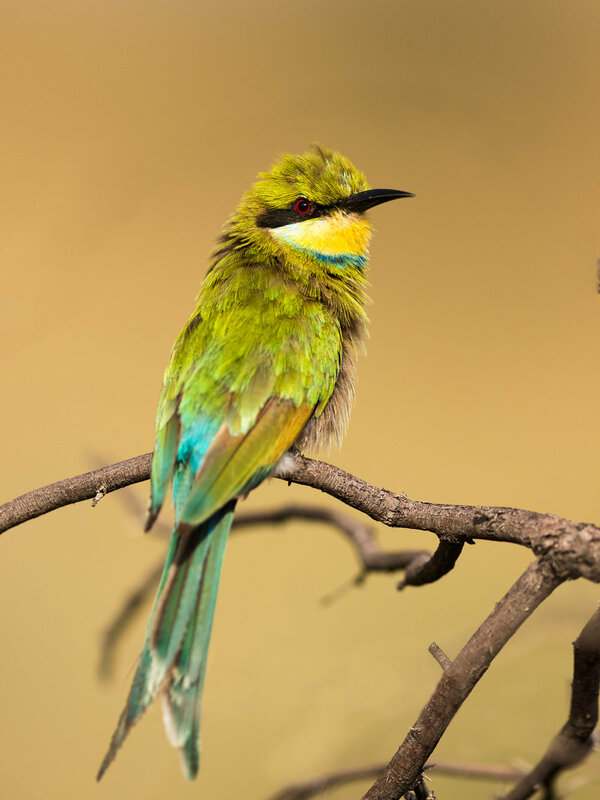 Click to enlarge - Swallow-tailed Bee-eater, Kgalagadi Transfrontier Park, South Africa. The golden morning poured over the Auob river valley and amongst the rusty branches of a dying camelthorn a group of bee-eaters were feeding. Their flickering wings and fanned tails flashed everywhere at once; now still and then, seemingly without any effort, flying; up into that perfect blue sky. I found it nearly impossible to catch them in flight, so instead, I waited for one to land - almost invariably with a striped bee, plump, succulent and tasty.